Our panels are mounted on common areas such as the roof to absorb energy from the sun. 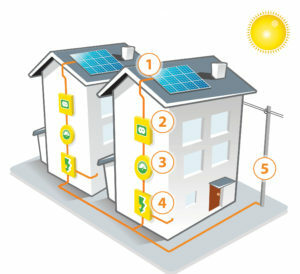 Inverters convert this energy into the same electricity your plug delivers. A meter reports to us on usage and other information to make sure everything is running 100%. The electrical panel distributes electricity to meet the complex’s needs. Your utility provider continues to supply electricity that can’t come from the sun.